At UN, Watered Down Climate PRST, Water Rising, Ecocide in ECOSOC? 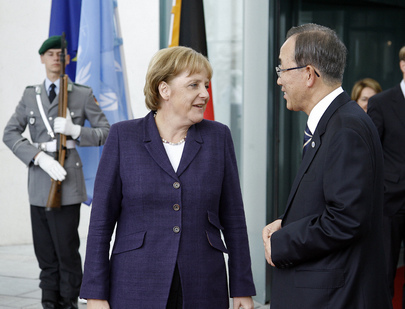 UNITED NATIONS, July 20, updated -- After 6 pm on Wednesday, the German presidency of the Security Council read out a Statement on climate change, eight paragraphs long. An hour before the statement came out, Bolivia gave a speech saying that the Security Council is not the venue for climate change, since the biggest polluters have veto power. Instead Bolivia proposed an “International Tribunal for Climate and Environmental Justice,” to hold polluters guilty for “ecocide.” One Council wag dubbed it the “Ecocide in ECOSOC” speech. Given the opposition to earlier drafts of the Statement, including Russia “breaking silence” on Wednesday morning, how did Germany get agreement? A well placed Permanent Representative told Inner City Press that Germany's foreign minister Guido Westerwelle spoke with this Russian counterpart Sergey Lavrov to seal the deal. While seeking confirmation, it is significant that is the perception: that a deal was cut. German Ambassador Peter Wittig was said to be prepared to take question, in connection with an unrelated Council press statement on Serbia's arrest of Goran Hadzic, indicted for war crimes in Croatia in 1991 and 1992. We'll see. Update of 7 pm -- while Ambassador Wittig, when Inner City Press asked if the diplomacy went "above the Permanent Representative level," merely said the process was "includive," it's been confirmed to Inner City Press that this PRST did come up in discussions between Westerwelle and Lavrov this week. So as the initial source on this asked: what deal was cut? Call it diplomacy. We'll continue on this. UNITED NATIONS, July 20 -- As more than sixty countries gave speeches about climate change in the UN Security Council on Wednesday, behind the scenes the German presidency of the Council tried to negotiate with Russia, and to some degree China, to get agreement on a watered down statement on the topic. As Inner City Press reported July 19, there was a range of opposition to Germany's draft in the lead up to a re-drafting meeting that afternoon. The result went into so-called “silence procedure” to see if it was acceptably to all 15 Council members. Russia broke the silence procedure. But Russia is not the only doubted. The Non Aligned Movement, for example, has opposed the Germans' proposal. On July 20 Egypt's Permanent Representative Maged Abdelaziz told Inner City Press that NAM does not want the Council to take any action on climate. “That is for the General Assembly and UNFCCC,” he said. He said NAM wouldn't oppose there being a Special Representative on climate change, but it should be created by the General Assembly, not the Security Council. Russia's Deputy Permanent Representative Sasha Pankin told Inner City Press that he has worked on the climate issue and it is complex. He asked, what would the Council actually do about it? Proponents of the statement pointedly ask how Brazil got support for their thematic meeting's statement, on development and security, but now climate change and security is a problem. Others wonder how HIV / AIDS can be in Council statements, but not climate change. But even the Association of Small Island States meeting on the morning of July 19 was inconclusive. There is philosophic or turf-based opposition to the Security Council “taking over” the issue of climate change. Even though the Germans have changed the language to address this so-called “encroachment” fear, it remains. So will the Security Council “remain seized” of climate change and security? Watch this site.